Although Barb has played rock, pop, country, and folk, bluegrass is her true love. While living in New England, she played bass with some of the finest bluegrass bands in the region, winning or placing in numerous band contests. Since moving to the D.C. area in 1999, she has established herself as a bass player in high demand for performance and studio work. As a songwriter, Barb writes from the heart. "All my songs are about real life," she says. "I write about the feelings we all share—love, longing, frustration, regret, grief, humor, anger, joy. My songs tell stories—stories drawn from my own experience that everyone can relate to." Her first solo CD, Sooner or Later, showcases thirteen of her original songs. It also features the stellar musicianship of D.C. area musicians Tom McLaughlin, Randy Barrett, Akira Otsuka, Tad Marks, and the legendary Mike Auldridge. 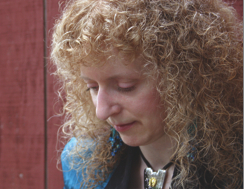 In addition to being a musician, Barb maintains a Web site, Barb Diederich's Bluegrass Links and Lyrics, which is considered one of the world's best bluegrass-related sites. "A solid bassist with a good work ethic. She plays well, sings, and knows just about every song ever recorded... She's a good friend and I have high regard for her and her playing." "... I discovered Barb's talent as a songwriter. I'm always in awe of a person putting stories of life to music... Barb shares her stories of love—new, jilted, unrequited and comfortable... My, my, that girl can sing." "A talented and beautiful woman."